Note: This post was originally published in The Delmarva Farmer and is reprinted with permission. The day I drove to Easton, Md. to discuss climate change with the staff of The Delmarva Farmer, it was raining so hard I couldn’t see the car ahead of me on the Bay Bridge. It’s easy to write off a torrential rain like that as just another case of bad weather. However, long-term records of rainfall in the Third National Climate Assessment in 2014 show that much more of our rain now falls in downpours rather than in the gentle soaking rains I remember as a kid. “Bad weather” is becoming more common. The increasing frequency of downpours in our region is just part of what scientists call “the new normal” under climate change. In Maryland, data released earlier this year by the National Oceanic and Atmospheric Administration show that the frequency of rains greater than 4 inches has increased since 1950, as have the number of days warmer than 100 degrees F and the number of nights over 70 degrees F.
Seasonal patterns of precipitation have also changed, with more rain typically falling in spring and fall and less rainfall in the summer. Winters are warmer and shorter and spring comes earlier. These new weather patterns are products of four big climatic changes that began in the mid-1800s: The air is warmer, the ocean is warmer, there is more water vapor in the air, and sea levels are rising. 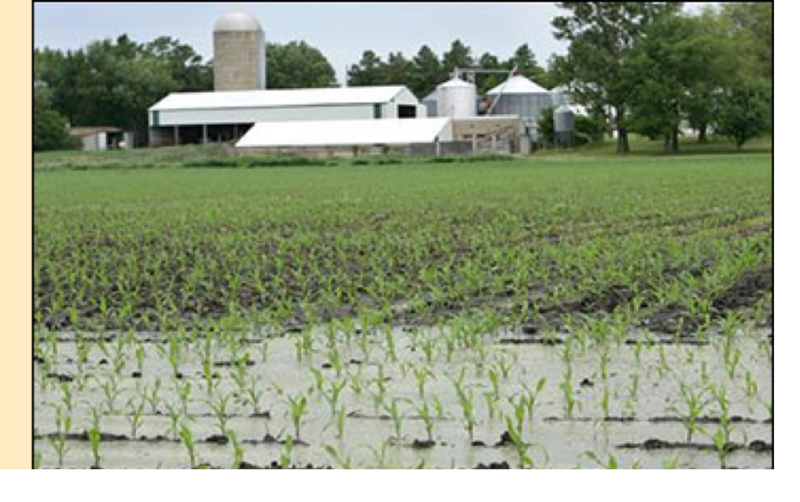 Although the impacts of the “new normal” on agriculture can be large, the USDA and others have identified strategies that will reduce risk in this changing environment. Those solutions and ways to maintain the profitability of Maryland farms as the climate changes will be the focus of this periodic column. Unfortunately, the long-term trends in weather patterns that show climate change are nearly impossible for us to detect during daily living. As individuals, we experience enormous weather variability. Temperatures vary tremendously across seasons and even between days, obscuring the gradual changes that have caused “the new normal.” Because we don’t personally experience the long-term weather trends that make up climate change, it is easy to ignore or discount them. Also, increases in risk caused by climate change can be tricky to interpret. Consider an example: we know that smoking causes cancer, and we can say how much a smoker’s cancer risk is increased. However, we can’t point to the specific people who will get sick or identify when it will happen. Some smokers will remain cancer-free. We just can’t say which ones. The same interpretation applies to risks from climate change. We will still have many years with terrific crop yields. The key is to recognize that yield-reducing floods, droughts, and high temperatures are now likely to come around more and more often. We can quantify the increased risk, but we can’t pinpoint which years will be bad, what the specific problems will be or when a particular farm will be affected. Climate change is often regarded as a problem of the distant future. But we can already see climate-related changes close to home in Delmarva. The Mid-Atlantic is one of the nation’s hotspots for sea level rise. In the 1950s, tidal flooding in Annapolis happened about five times each year, now it occurs 50 times per year as high tides move upward. A 2015 report from the Union of Concerned Scientists predicts that if sea level rise continues at the same pace, the streets near City Dock will flood 180 times each year by 2030. Coastal communities all across the Chesapeake region are in the same situation. Flooding during high tides is becoming commonplace. Saltwater intrusion into groundwater due to sea level rise is already causing the soil in some fields on the Eastern Shore to become salty, damaging sensitive crops like soybeans. 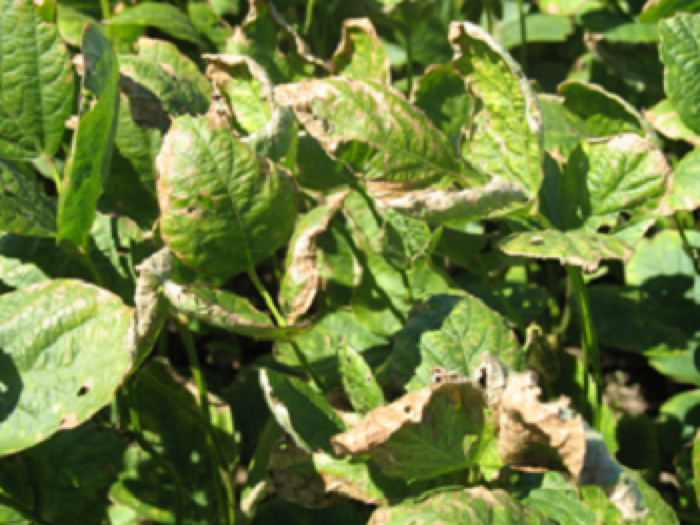 Longer, warmer summers can make for increased population sizes of insect pests, while wetter springs and falls intensify disease and can make it hard to plant and harvest. Warmer winters mean that fruit crops may not accumulate enough chill hours for a good bloom. This year, the record-breaking warmth in February caused many fruits and ornamentals to bloom early, subjecting them to risk of freeze damage during March. Recognizing the impacts that climate change is already having on agriculture, the USDA established eight regional Climate Hubs in 2014. These Hubs are tasked with providing farmers with up-to-date advice on how to minimize the risks. Last year, the Northeast Climate Hub, which serves Maryland, released an analysis of how different agricultural commodities are affected by climate change and what farmers can do to minimize their risks (Northeast Regional Climate Hub Assessment of Climate Change Vulnerability and Adaptation and Mitigation Strategies). I welcome all comments and questions at svia@umd.edu. Climate change is real. Despite widespread confusion across the US population, 99% of scientists now agree that human-caused climate change is a reality. Scientifically speaking, there is just no doubt. We can see the signs of climate change in many independent processes– to name a few, the sea level is rising, average temperatures are increasing, 9 of the 10 hottest years since 1884 have been since 2000, the CO2 concentration in the atmosphere (which for 800,000 years before the present never exceeded 300 ppm) is now 409 ppm, glaciers are shrinking etc. Even if you choose to disbelieve the science, it seems unlikely that any hoax could result in the simultaneous changes in so many of Earth’s processes. There is no scientific controversy, and no need for additional facts or discussions. This issue is settled. We know what is happening, and what will occur in the future if we don’t do anything to stop it. We know what to do and the technologies are available. The economic consequences of inaction are severe, and it is now cheaper to solve the problem than to ignore it. 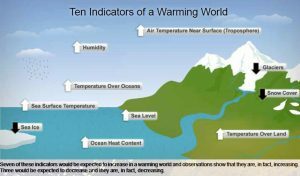 Why is climate change occurring? 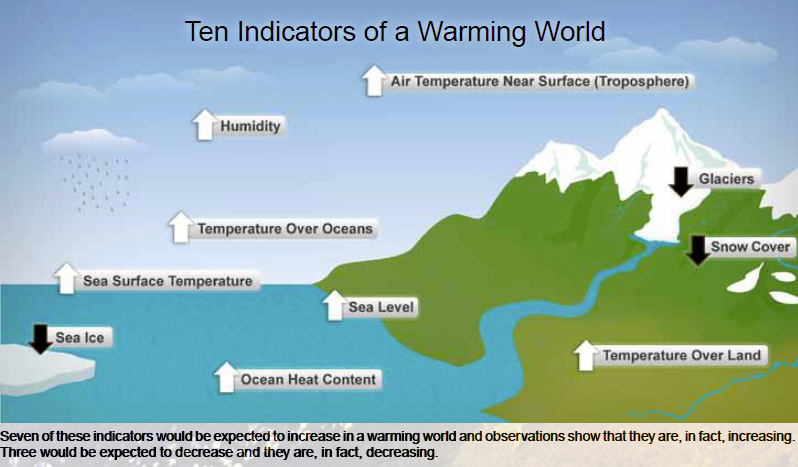 Carbon dioxide and other “greenhouse gases” (water vapor, methane, nitrous oxide) slow the loss of heat from Earth. So, the more or less constant input of heat from the Sun is not leaving the atmosphere fast enough for the temperature to remain in balance, so the air is warming up. Easy! You can see the increasing temperature trend for yourself in this NASA animation of global temperatures since temperature records began in 1884. Don’t worry about the fact that temperatures can vary a lot in a single location—the trend is clear. But the story doesn’t end with increasing air temperature. Over 90% of the increased temperature and a lot of the extra CO2 have been absorbed by the world’s oceans, which have been gradually warming up and becoming more acidic (CO2 becomes carbonic acid in water). Warmer oceans cause more evaporation, and the warmer air holds more of this water. The air is now about 5% more humid than it was in the 1880’s. So what? That doesn’t seem like much—until you consider that tropical storms gain energy from a warm ocean. The winds from Hurricane Sandy circulated all the way out to Michigan, gathering water over the entire Eastern part of the country. In that setting, 5% more water vapor in the air can make a big difference. Climate change is a recipe for severe and highly variable weather, increasing the frequency of storms like derechos and causing “false springs”, like the one we had due to this year’s freakishly warm February (see earlier post). 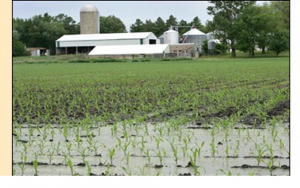 Maryland farmers largely escaped the devastating impacts of the subsequent freeze, but farmers further south had serious crop damage. Don’t get your hopes up for Georgia peaches this summer. Climate change affects almost every aspect of life. Increased temperatures and shorter winters mean that snowpack in areas depending on meltwater is much more limited than in the past. This was a primary cause of the 5+ year drought in CA. The fire season in the West is now 2-3 months longer than normal and fires burn hotter than ever. Warm temperatures and less rain over the plains produces droughts and impacts food production. Cities have become “urban heat islands”, and can be up to 9o F hotter than the surrounding suburbs; coastal regions are experiencing more and more “sunny day flooding” as the height of high tides increases with sea level rise. Annapolis, Baltimore and Washington DC are all facing increasing flooding from both storms and sea level rise within the next decades. Warm air temperatures worsen the impacts of air pollution, which already claims as many lives in the US as car accidents. Climate change has other serious impacts on health: heat stroke is increasing, new diseases are appearing as the climate in the US warms enough to be suitable for disease vectors like mosquitos, food safety is compromised in warm weather and floods. The list is long, and you can learn more about the impacts of climate change on health here. What can we do? The best solution for climate change would be to have a unified set of federal policies aimed at reducing US emissions from power plants and the transportation sector. This is unlikely for at least the next few years. However, states and cities remain steadfast in their determination to combat climate change, and even the nation’s largest companies are advocating for strong climate policies and becoming more sustainable in their own practices, as covered in virtually every major news outlet. Individual actions can also make a big difference—you can be models for your friends and neighbors by increasing the sustainability of your home and landscape. Simple changes in what you eat, how you use your car, the temperatures at you keep your home, the way you garden and landscape can make a big difference, and these changes do not require privation or being uncomfortable. Read how here and here. Using energy more efficiently in your home, particularly during peak times when energy demand is high, will make a big difference in carbon emissions by reducing the demand for power. Typically, the surge in energy demand on hot summer days is met by increasing the output of the oldest and dirtiest power plants, which are the least efficient to run and emit large quantities of ozone-forming nitrogen oxide compounds (“NOx”). You can make a real difference by enrolling in utility plans such as BGE’s “Peak Rewards”. By allowing the utility to turn off your air conditioning for an hour or two on the hottest days, you can play an important role in reducing air pollution and carbon emissions in Maryland. Other utilities offer similar programs: Pepco’s is “Energy Wise Rewards”, SMECO’s is “CoolSentry”. Also, each utility offers the opportunity to purchase the energy you use from any supplier, including those that offer wind power. So even if you can’t erect a wind turbine in your yard or put solar panels on your roof, you can ensure that the energy that you use comes from clean, renewable sources. This week, I read a fascinating article in The Guardian, and it made a big impact on me. It showed a version of the graph below, which is a fairly standard picture of the temperatures observed between 1884-2015 and the projected future temperatures under different emissions scenarios. The horizontal dotted red line is at 2oC, the temperature rise that scientists think the Earth can stand before critical ecosystems begin to collapse. Somewhere between 4-5oC of temperature increase, we cross into a realm never before experienced by humans in which it may even be impossible for plants to grow. -RCP8.5 (red) is business as usual, continuing on as we have been with no action. I really don’t want to live in that world. -RCP2.6 (yellow) is the projected temperature if we take prompt and aggressive action to curb climate change — this means that CO2 levels need to peak by about 2030 and decline to near zero by 2100. In this scenario, global temperature will level out at about 2oC over historical values. Not very nice by today’s standards, but probably livable. By overlaying the lifespans of myself and my kids, I could see exactly what these different futures mean for my family and all of a sudden things became personal. I was born in 1951, and I’m hoping to live to 2050—my lifeline is shown in black. My sons were born in 1990 and 1994, with presumptive lifelines in blue, and my grandkids (who haven’t yet appeared) will live during the period spanned by the purple line. So when I say that I want to solve the climate crisis for my kids and grandkids, do you see what I mean? If we do nothing, my kids could live to see a time when ecosystems are failing and most plants might not even grow (blue star). At that point, what could the future possibly hold for my grandkids? This looks really scary– should we just give up?? Your choice. We know how to achieve the conditions for RCP2.6—we have all the technology, and we now know that it is cheaper to fix the climate problem than to do nothing. We even have enough time if we work fast. We just need to make it happen. 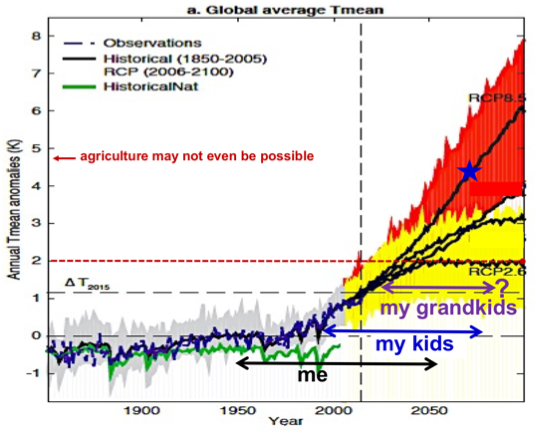 99% of scientists now agree that climate change is occurring and that the worst case scenario shown in the red band below will come our way if we do nothing. People can choose to believe that the science isn’t true, but that’s a very, very risky bet. Are you willing to consign your kids and your grandkids to that future, or to let others make that choice for you? I’m not. False spring: Just the same old variable weather or new territory? February 2017 was the second warmest in history—as warm as the average March in our region. Grass greened up, it felt like spring, and many plants started to break dormancy. Everything was great until things went back into the deep freeze from March 20-22, when many locations in Maryland had night temperatures between 23-28 degrees for 1-3 nights. This is what climate scientists call “false spring”—very warm weather that seems like a welcome end to winter, just to be followed by a hard freeze later in March or April. In the past ten years, the Eastern US has experienced three devastating false springs: 2007, 2012 and 2017. The extent of agricultural damage after the freeze during this year’s false spring depends not just on the developmental stage of the crop, but on a number of other factors—when the weather began to warm, how long it stayed warm, whether development was slowed by subsequent cooler weather, how far along crops had gotten by the time the freeze hit, air speed and humidity, how cold it got and for how many days the cold weather lasted. Because these factors can vary widely across a region, it isn’t surprising that the damage seen after the March 2017 freeze depended on location. Maryland farmers were lucky—although the earliest blooming fruits like apriums and apricots were heavily damaged in central Maryland, grapes, apples and blueberries were not far enough along to be affected, and strawberries were still weeks from breaking dormancy. At Swann Farm in Calvert Co., it originally appeared that up to 85% of peach blossoms had been lost. However, more extensive sampling of blossoms revealed that early and late blooming peach varieties sustained only 25-50% damage, while the mid-summer varieties were at their most vulnerable at the time of the freeze, and were 100% destroye d for the year. 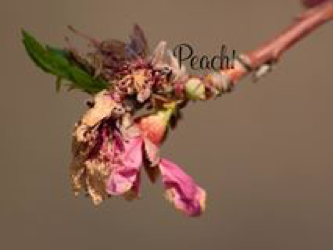 Swann Farms published some useful pictures that show how to determine damage to a blossom by pulling off the damaged bloom to see if there is a tiny peach underneath (see white structure under the word “Peach” in this photo). Farmers to the South of us weren’t so lucky. In central Virginia, peaches, nectarines and cherries were damaged, and some plum orchards were lost entirely. Fortunately, most apples bloomed after the freeze, though some crabapples used for pollination of apples were damaged. South Carolina lost 90% of their peach crop, and Georgia peaches and blueberries were severely damaged. Some North Carolina farmers were able to save their strawberries by pulling out the row cover—using two layers in some cases. So, when we get a spring freeze, is it just bad luck we can chalk up to typical weather variability? Maybe not– climate scientists have shown clearly that spring is coming earlier these days. The 2014 National Climate Assessment showed that the Northeast (which includes Maryland in the eyes of climate scientists) now experiences an average of 10 fewer frost free days than we did between 1901-1960. Studies of plant populations show that many plants are blooming earlier in response. Scientists from Cornell showed that apples in upstate New York are blooming an average of 8 days earlier than in the 1960s, while grapes are blooming 6 days earlier. When Smithsonian scientists analyzed 30 years of data on bloom times of common plants in the DC area, they found that 89% are blooming earlier now than in 1970 by an average 4.5 days. 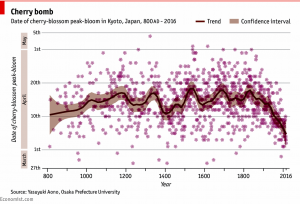 Bloom times of cherry trees in Kyoto Japan have been tracked since 800 AD. Despite considerable variability, the average bloom time remained within a relatively narrow range until about the time of the Industrial Revolution, when it declined sharply. 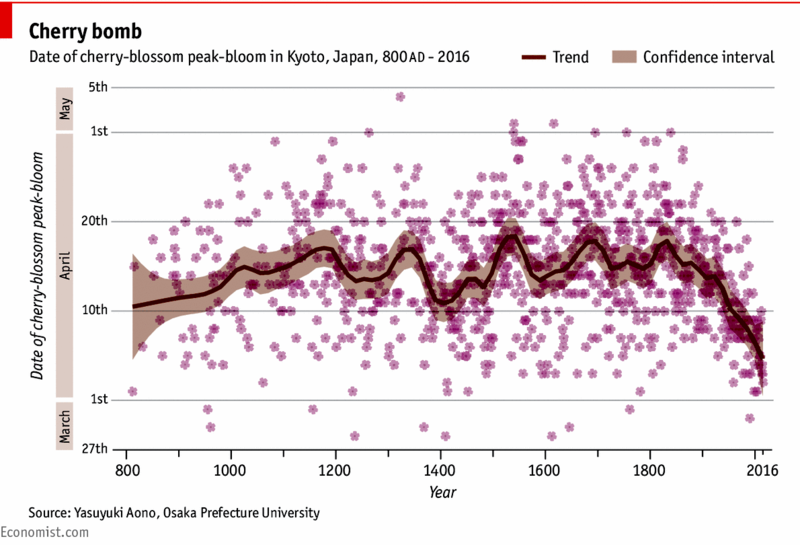 By far the most amazing demonstration of earlier blooming is shown in a study of bloom dates of cherry trees in Japan, which have been monitored since 800AD. Despite a lot of noise due to weather variation, the bloom times remained within a fairly narrow window until about 1875, when the trend line shows a sharp decline in flowering date, leaving that historical range. This is just what we would expect if the earlier flowering is a response to global warming, which started during the Industrial Revolution in the mid-1800s. 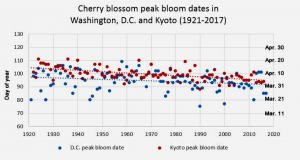 How does the flowering time shift of the cherries in the DC Tidal Basin compare with that seen in Japan? 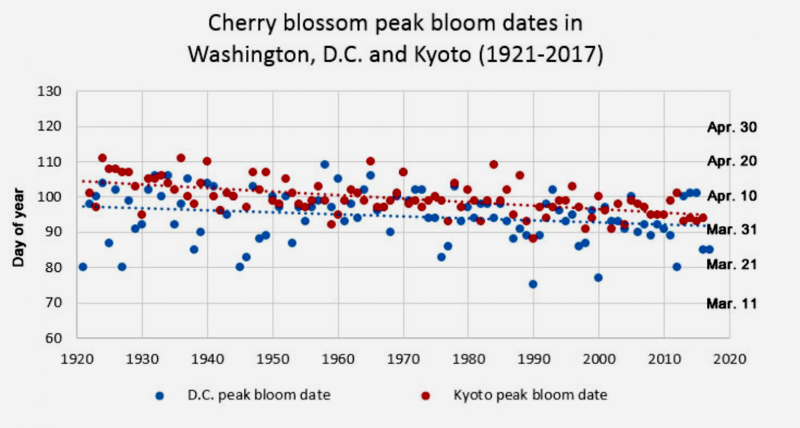 Jason Samenow of the Washington Post’s Capital Weather Gang explored this and found that although the DC trees flower a few days earlier on average than the trees in Japan, both populations have shifted at approximately the same rate. This is good evidence that the cause of the shift is the same in both locations– warmer and earlier springs due to climate change. Although spring is coming earlier, temperature variability has remained the same or even increased, so those spring freezes we are used to in March and April remain highly probable. Any way you look at it, earlier spring coupled with a continued or even increased probability of March and April frosts means that the threat of freeze damage to spring crops is likely to be a problem that farmers on the East Coast will face more and more often. How can you protect your fruit crops from false spring and damaging late freezes? The experience at Swann Farms illustrates one of the best ways to minimize freeze risk—plant multiple varieties that break dormancy and/or flower at different times. If varieties are at different stages when a freeze occurs, only part of the overall crop will be damaged. Fortunately, many farmers already plant several varieties in order to market a given crop over a longer period of time. UME Extension Specialist Joseph A. Fiola has a number of good articles on detecting and preventing freeze damage in grapes. Links to basic freeze protection techniques that can be modified for other fruit crops can be found on his webpage Timely Viticulture. One clever method from Michigan State that might be useful in particular situations involves improving air flow through orchards by removing vegetation in key locations; additional information about basic freeze protection is also available at that link. If you have comments or experiences with false springs you’d like to share, please email me at svia@umd.edu. Science is a process that reveals what’s true, whether you believe it or not. How do we figure out how the world works? We have an idea, we test it and we find that the results either support our idea or they don’t. If we do multiple tests and don’t see the results that our idea predicts, we either reject the idea as false, or we modify it and retest. If we persist and refuse to accept any idea that we or others have shown is false, we close in on an explanation that is likely to be correct. We have all done this a million times for problems as mundane as why a recipe failed or the sink leaked. In fact, babies are the ultimate scientists—they learn how their strange new world works by incessantly testing possibilities until they figure out how to gain mom’s attention, how to sit up, how to walk, what happens when they touch that hot stove. This is the process of science. Professional scientists use the same process—they repeatedly test every new idea, tossing out or modifying ideas that don’t work until they find an explanation supported by multiple tests. 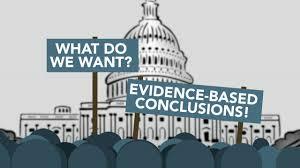 But before a scientist can make a public claim that an idea is true, it has to be reviewed by other experts in the field to ensure that the scientist’s tests and analyses of the results were appropriate. Usually, this peer review stimulates further independent testing by other scientists. This process ensures that scientists can’t go public with an untested opinion, or worse, with an idea that has been tested and shown to be untrue. Other scientists just won’t allow it. Through this iterative process, scientists throughout human history have figured out how our world works—that objects fall to Earth because of gravity, that the Earth revolves around the Sun, that germs cause disease. These ideas are now so well tested that virtually everyone accepts them as truth, even though each was initially denied by skeptics who wound up on the wrong side of history. There have been many independent tests of the idea that the climate is changing due to the increasing concentration of carbon dioxide in the atmosphere from burning fossil fuels. We’ve measured CO2 levels that are far outside the range of any known natural oscillations, and tests reveal that explanations of non-human causes like increased volcanic action or more solar radiation just don’t match the observations. Multiple seemingly unrelated predictions about what we would see if climate change were caused by rising CO2 have been verified: Have glaciers melted? Check. Has the ocean warmed and become more acid? Check. Has sea level risen? Check. Has severe weather become more common? Check. Does spring come earlier? Check. And so on. The idea that the climate is changing as a result of human activities has been tested so many times in so many different ways that 97% of scientists agree that it is true. Will we refine our understanding as scientists continue to probe? Of course. But the basic facts will not change—we are in a climate crisis caused primarily by burning fossil fuels for energy. Nobody knew that this would happen back at the time of the Industrial Revolution. But now we know, we know how to fix it, and it is our responsibility to act. The process of science leads us to the truth about how our world works. When major new truths were discovered in the past there were always deniers who refused to accept them. But denial didn’t stop gravity, it didn’t cause the Sun to revolve around the Earth, it didn’t keep germs from causing disease, and it won’t stop climate change. When national policy is based on the choice to deny well-supported scientific truths, we are all left vulnerable to the consequences. Denial won’t stop climate change, but it can certainly prevent us from finding and implementing solutions, to everyone’s peril. Solving problems is what Americans do best, so let’s get on with it! Matthew on False spring: Just the same old variable weather or new territory?